How Can Something So Nutritious Taste So Good? Black currants are a berry brimming with vitamin C (in comparison, oranges are like water) and other health goodies, with an intense, rich, to me resin-y flavor that pairs well with dark chocolate or, on bread, with peanut or any other nut butter. Not everyone enjoys the fresh flavor, but that’s okay. Not everyone needs to enjoy every kind of fruit. With that said, just about everyone does like black currants once they’ve been cooked and sweetened to make jam, juice, pie, and the like, or soaked in alcohol to make a liqueur (créme de cassis). My preference is for the raw berries, eaten straight up, in my cereal, or smooshed on bread as an instant jam. Black currants have more to recommend them than only good flavor. In contrast to most fruit plants, they fruit well in shade. 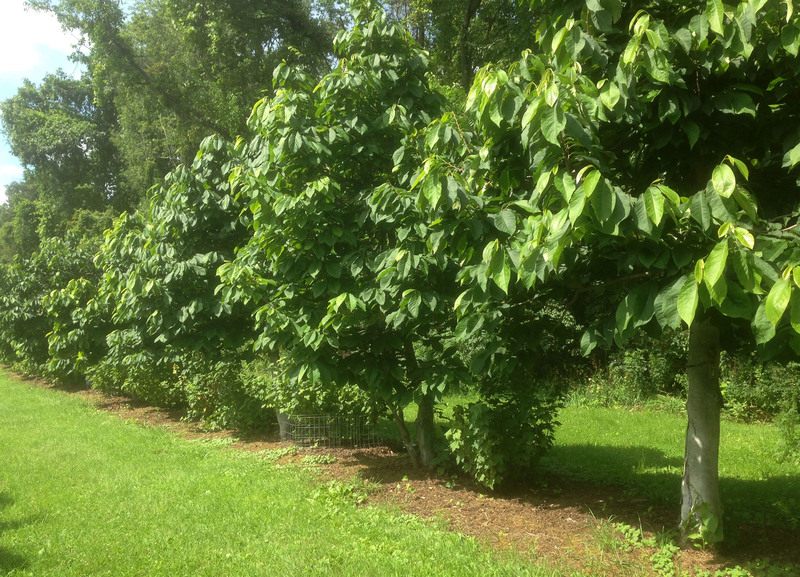 Look down my row of pawpaw trees, and in the shade between every two of them you’ll see a black currant bush thriving. 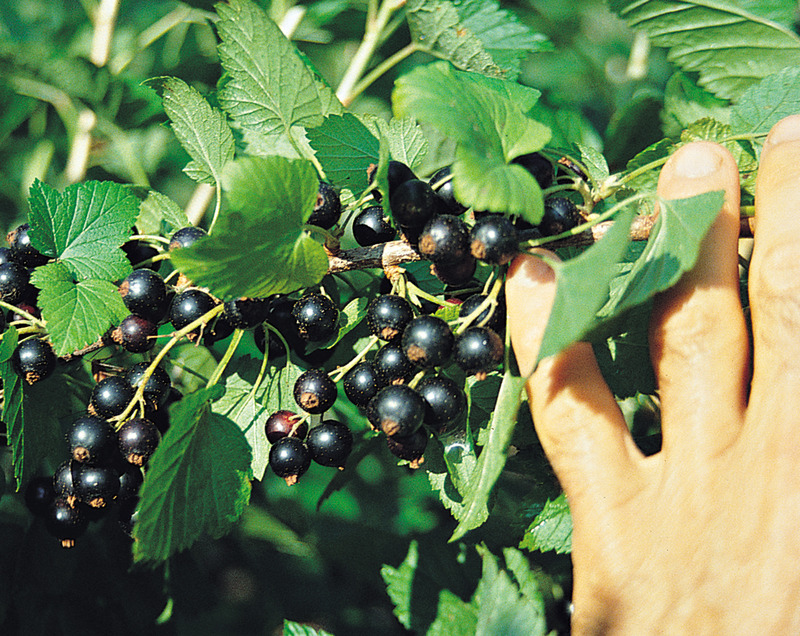 In contrast to just about every other plant, black currants are deer resistant. My ducks and chickens, as well as wild birds, leave the berries alone. In fact, few significant pests attack the plant or the fruit — except for a disease called white pine blister rust. This disease needs two different host plants to complete its life cycle, a susceptible variety of currant or gooseberry, and a white pine. Because the disease can kill white pines, an important timber crop, gooseberries and currants were once banned by federal law. That’s no longer the case, one reason being that most cultivated varieties of gooseberries and currents are not very susceptible to the disease. Black currant is very susceptible to the blister rust disease — except for some rust-resistant or immune varieties. The first of these, Consort, Crusader, and Coronet, developed in the middle of the 20th century, were not very tasty just popped into your mouth raw. Newer rust-resistant varieties, such as Belaruskaja and Titania, are delicious any which way, and along with blueberry are my favorite fruits. Sad to say, black currants are finished for the season. That’s their one deficiency: They come and go too quickly. Still, bags stuffed full of black currants are now in the freezer, not to be opened until Christmas. And I can’t complain. Branches of blueberry bushes are bowed to the ground under their weight of fruit, and will continue to do so until almost the end of summer. And gooseberries still have a a week or so more of fruiting. Mulberries, too, have a few more weeks, except that the birds are eating most of them. Red, pink, and white currants started fruiting with the black currants, and will hang in good eating condition for weeks to come. 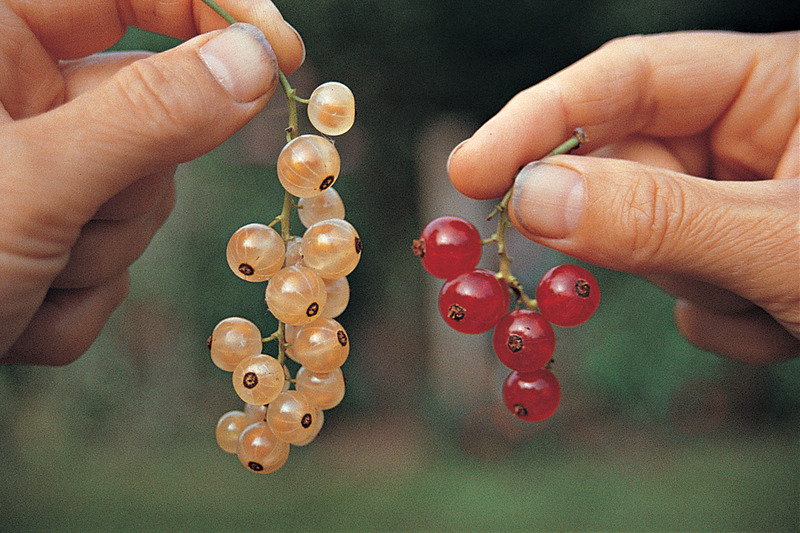 Red, pink, and white currants are different varieties of the same fruit (like Red Delicious and Golden Delicious apples), a different species and quite different in flavor and bearing habit from black currants. Most of the reds, whites, and pinks will hang from the branches for weeks because the berries, looking like shiny, translucent chains of beads, the seeds visible seemingly floating within when backlit by the sun, are almost too pretty to harvest. Also, not being my favorite fruits, they get to hang without being picked, especially with the abundance of other, tastier (to me), berries, an opinion that might change if I had some skill in jelly-making. Liberty Hyde Bailey would be proud of the abundance and variety of fruit here. That’s one great advantage of planting your own: You get to choose what pleases your palate as far as kinds of fruits and varieties of fruits, and you get a hedge against a poor harvest from one or a couple of fruits any year. 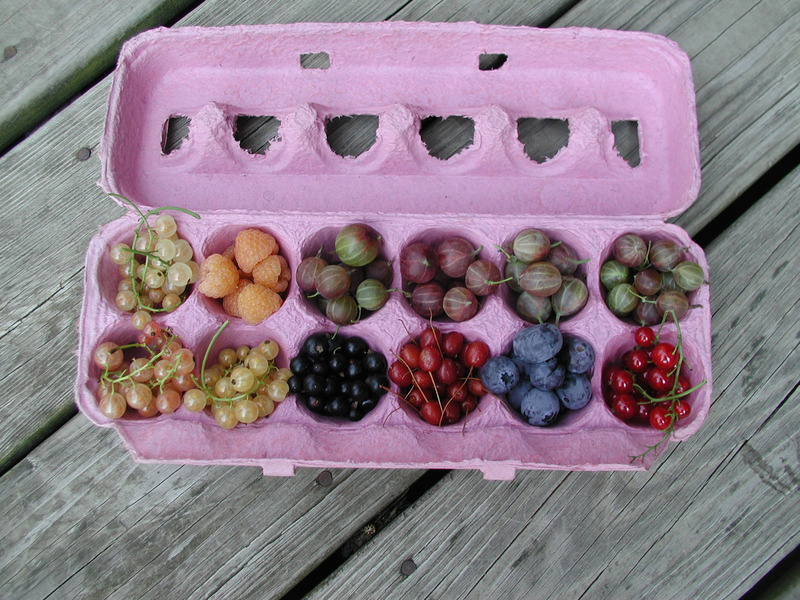 Hence the Macoun and Hudson’s Golden Gem apples here, the grapes, and gooseberries (a dozen varieties of each), gumis, raspberries, kiwis, seaberries, and elderberries, among many other fruits. Professor Bailey had great faith in the role of the hobbyist, the amateur (in the true meaning of the word, the lover) in fruit growing. Try it. One route to cultivating a greater appreciation for fruit and know-how for growing them is to join North American Fruit Explorers, a band of fruit “nuts” drawn from both academia and backyards, but all amateurs. For more information about some lesser know fruits, including black currant, I recommend my own book, Uncommon Fruits for Every Garden. This entry was posted in Books, Fruit, Gardening and tagged black currant, fruit, Liberty Hyde Bailey, red currant. Bookmark the permalink. Trackbacks are closed, but you can post a comment. 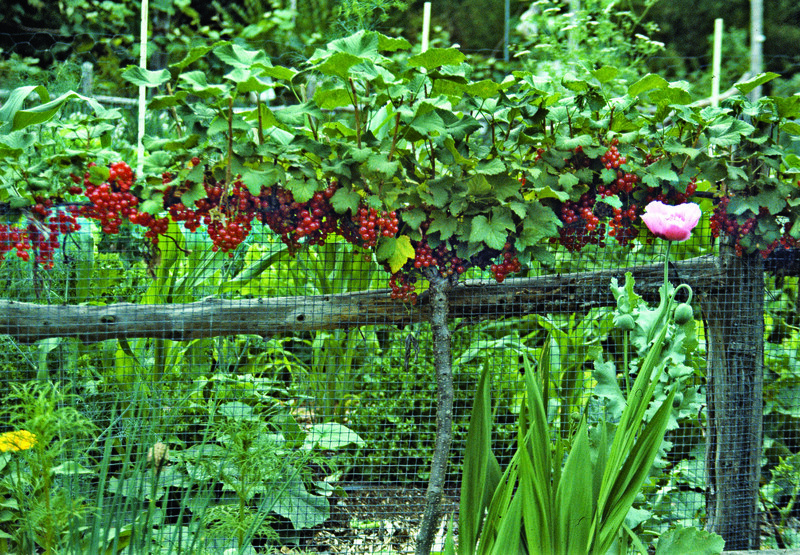 That red currant espalier just makes my heart sing. That and the thought of black currant syrup. Gorgeous photos. I love having your blog to visit and see the garden through the year after my late Spring visit (thanks again so much for making the time ). Happy gardening! Truly inspiring! I love the espalier. My blueberry bush isn’t very happy and I’m sure it’s the soil. I keep fertilizing with sulfur but the best bet is to have the soil conditions to begin with, n’est pas? I have a white pine on my property and I sure don’t want to jeopardize its good standing, but I also have a couple of spice currants and its been years. I was so inspired by all of you black currant growers that I popped a few of the spice currants in my mouth – not bad. I didn’t get to my service berries in time, but my kiwi vine is taking off this year and has made it’s way to the trellis on our porch. You have inspired me to grow more fruit! LOVE your summer berry assortment. I grow gooseberries (Hinnomaki Red), and I love them, but it’s a punishment to pick them. Is there a thornless variety you’d recommend? Yes. I highly recommend the variety Captivator. It’s delicious (much better than Hinnonmaki Red) and nearly thornless. Morning! I’m picking two varieties of black currant to grow, mostly for taste, not productivity. Since I live in area with white pines I figured rust resistance is a must. So far I narrowed the search to Belaruskaja, Minaj Smyriou and Titania. Could you recommend the elimination candidate out of those three and/or any better alternatives I might have missed?